This week reminds us of all that we have to be thankful for. One note from our longest tenured team member at DLRC, Mary Lee, stated that she is thankful for a wonderful job. If any of you have had the opportunity to work with Mary Lee, you may have been surprised to hear that she has now been with us for 25 years. She is the perfect example of a person at DLRC that that I am thankful for. We love what we do, we love the people that we work with, and we are all thankful for this opportunity that we have. This also reminds me that we have so much to be thankful for in our lives, like our customers, family, friends and our health. We hope that you get the opportunity to spend some time this week with friends, family and loved ones, coins, pets, or whatever makes you happy. And we hope to get the chance to work with you in the next week. Our office will be closed Thursday and Friday so that we can spend time with our loved ones. If you need to reach us, we will be checking emails over the weekend at coins@davidlawrence.com. As for now, I’ll leave you with a few pieces we hope that you can enjoy, and we wish you all a wonderful and happy Thanksgiving! Why we love it: The 1921-S is the key to the Walker set in most grades from VG-MS64, in which MS65 examples of this date are seldom offered and highly desired. This is a lovely, mostly white gem with a light golden patina and a faint hint of rose near the rims. The luster and strike are exactly what you'd expect from the date giving it ideal eye appeal. NGC recognizes just two others as finer. Value: The PCGS Price Guide has this coin valued at an even $110,000 with the CPG Value set extremely comparably at $108,900. 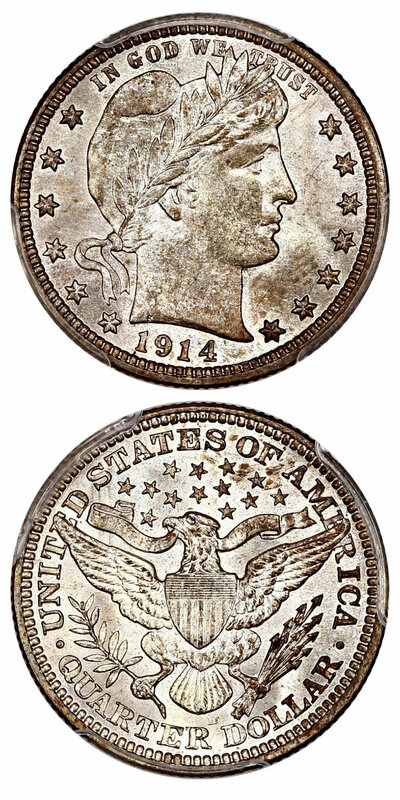 Our NGC-graded gem example of this Key Date Walking Liberty Half Dollar is in this week’s auction with a reserve that is set around $40,000 below the price guides at just $70,000. This key date is seldom available in gem condition, and this absolutely choice example is a rare offering that we’re please to feature this week. Why we love it: A beautifully toned gem example of this underrated key date S-Mint Buffalo Nickel, in which just six others are graded finer by PCGS. The surfaces are surprisingly well-struck for this notoriously weakly struck date. The rainbow colors that are most prevalent on the reverse combined with its satiny luster give this piece terrific eye appeal and make it a very desirable key date offering. Value: The PCGS Price Guide has this coin valued at an even $14,000 with the CPG Value set a good bit higher at $15,700. Our rainbow toned gem example of this scarce S-Mint issue is in this week’s auction and reserved far below both price guides at just $12,500. Why we love it: The perfect high-end type coin for the Capped Bust Dime Series as it comes with the coveted NGC Star and stunning eye appeal. Its surfaces consist of flashy, lustrous fields and well-struck devices that are covered in lovely copper-golden colored toning. There is just one piece graded finer by NGC in a flat MS67 holder, which makes this “starred” plus grade MS66 a perfect option at less than half the price of the 67. Value: The PCGS Price Guide value sits at $21,000, which we find to be quite accurate for this coin via Make Offer, this piece can be purchased comparably at $20,500. That is a fair value as that price still comes in $500 below the PCGS Price Guide even with the expected and deserving premiums of this lovely toning and its NGC Star. 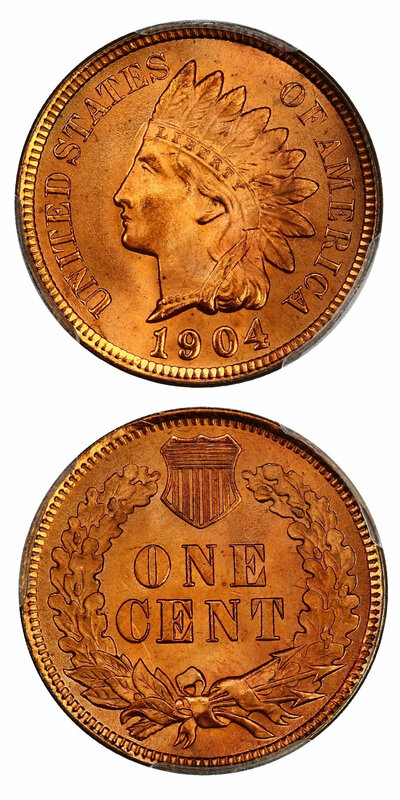 Why we love it: A gorgeous ultra-gem Indian Cent type coin that is of the highest registry quality as it is tied for the finest known example of its date. This piece offers incredible eye appeal as its surfaces are superbly pristine and lustrous with blazing red-orange color that make it beautifully unique. Value: The PCGS Price Guide has this red-orange ultra-gem valued at $13,500 yet it is reserved in this week’s auction at just $10,450. That is a quite generous discount of over $3,000 off the price guide even though it shares the prestigious title of the finest known in existence. Why we love it: An immaculate ultra-gem example of this otherwise common date Barber that is tied for finest known in existence with just two other pieces. This stunner displays frosty luster and attractive, original toning that combined with its blemish-free surfaces make for high-quality eye appeal that backs up its CAC approval. Value: The PCGS Price Guide value sits at $5,750, and our example is available via Make Offer for just above at $6,200. That is still a good value as the PCGS Price Guide does not account for the premium that this example holds with its CAC approval. 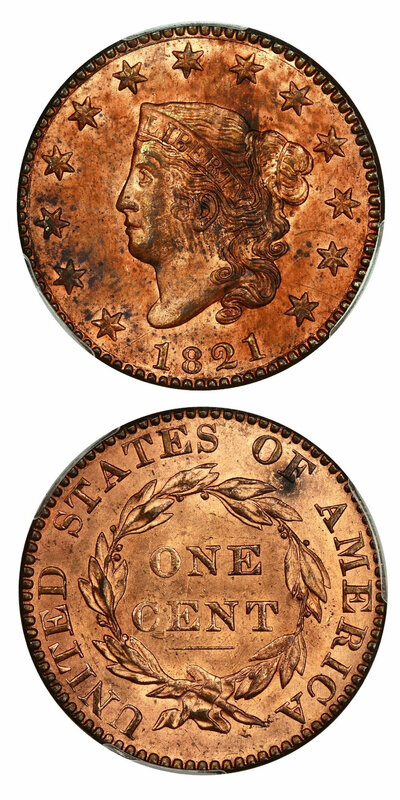 Why we love it: A seemingly almost cameo example of this excessively rare proof Half Cent with captivating toning. The color displays pretty pink and blue highlights on the obverse and lovely lavender and blue tones covering the reverse of this absolutely immaculate gem. From an extremely tiny mintage of just 20 coins struck, this example is the finest known in existence graded by PCGS with the Red Brown color designation. 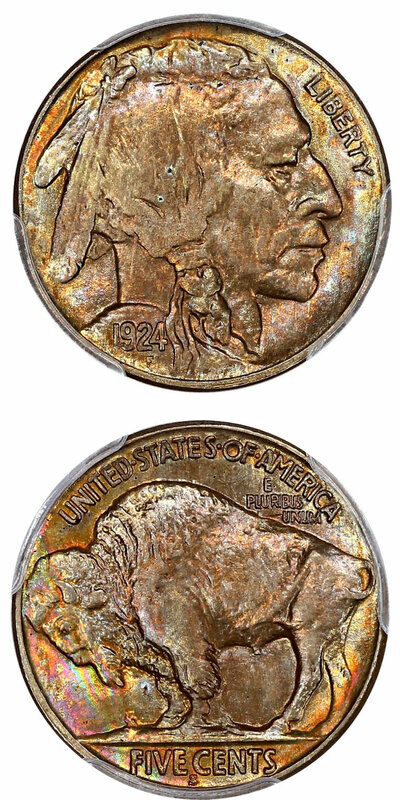 Value: This gorgeous proof Half Cent defines the term “one of a kind” perfectly as it possesses lovely toning, extreme rarity and owns the title of the finest graded example. These qualities make it incomparable to any price guide. This incredible coin is available in this week’s auction reserved at just $31,750, which is an excellent value for this rare, stunning gem. Why we love it: A high-end near-gem example of this popular key date from the middle Large Cent years. The eye appeal and surfaces are incredible with its strong overall luster, gorgeous remaining red tints in the obverse fields and a bright golden red reverse. A few scattered spots account for the Red Brown color designation, but we have seen darker, less attractive pieces designated as "Red" in recent years. From a moderately low mintage of just 389,000 coins struck, this example is tied for the finest known in existence graded by PCGS. Value: The Greysheet bid (CDN wholesale) price on this lovely piece comes in at $42,500 with the CPG at $51,400! While the PCGS Price Guide has this red-brown near-gem coin valued at just $45,000. It is offered in this week’s auction reserved at the fair and comparable price of just $43,500. That is a solid $1,500 discount off the already conservative PCGS Price Guide even with the beauty, scarcity and share in the title of finest graded that this coin beholds. 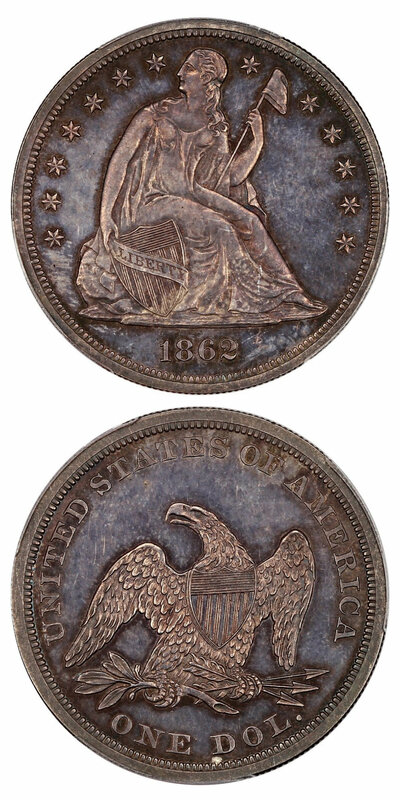 Why we love it: A richly toned near-gem example of this popular and scarce Civil War Issue Seated Dollar. These lovely, gem-like proof surfaces display gorgeous, captivating eye appeal. The coloring features mostly violet and a dull rose-gold throughout with a vibrant blue around the rim that can be seen in the light at the right angle. From a low mintage of 550 coins struck, there are just 14 others graded finer by PCGS. Value: The PCGS Price Guide Value comes in at $6,500 on this coin, which we find to be accurate so via Make Offer, this piece can be purchased for just $6,750. That is not just a fair value but an excellent one as the PCGS Price Guide does not account for the premium that this example holds with its CAC approval. That premium is far from covered in the extra $250 since the coin is valued at $24,000 the next grade up. Why we love it: The High Relief Saint Gaudens is one of the most popular and beautiful designs across all of U.S. Numismatics. This stunning CAC approved example of the Flat Edge Variety possesses the eye appeal and overall surface condition of a grade higher as it is absolutely pristine with no detracting blemishes. Value: The PCGS Price Guide has this coin valued at $25,000, although our example can be purchased via the Make Offer function for a full $1,000 discount for just $24,000. That is an extremely fair price point for an example of America’s Most Beautiful Coin that comes with a CAC Sticker! 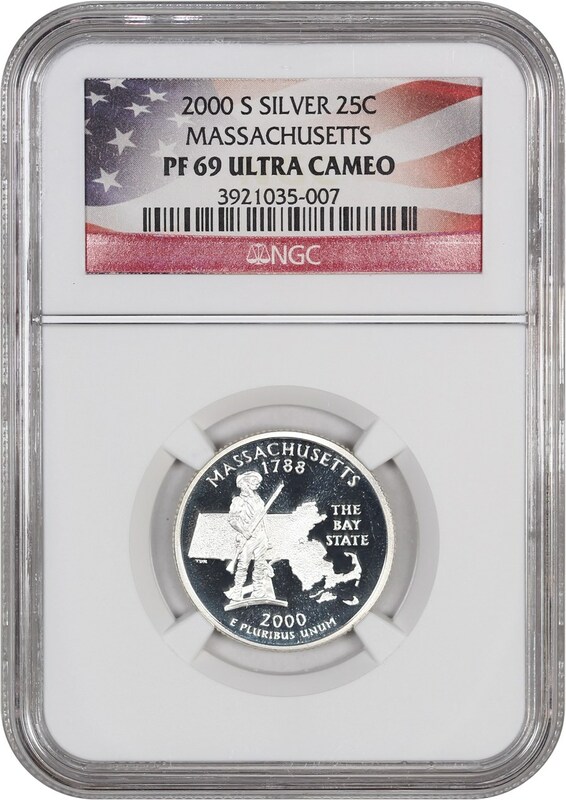 Why we love it: A fun, historical CWL offering of the Massachusetts Quarter that came in the silver proof sets from the year 2000. Since the Pilgrims landed in Plymouth, Massachusetts, we felt this was a nice, affordable way to combine Numismatics with Thanksgiving. Value: At just $15 via our Make Offer function on our website, this timely and extremely affordable offering is a fun way for everyone in the coin community to celebrate Thanksgiving! Why we love it: The 1895 Morgan Dollar is famously known as a proof-only rarity and more specifically as the set-stopper to the entire series. Because there were no business strikes produced and the mintage was limited to 880 coins, this coin is found desirable by any advanced numismatic enthusiast and of course, especially by collectors of the series. This stunning dark grey toned example exhibits deep watery fields with colorful bands of blue along the lower rims. Value: The PCGS Price Guide value sits at $55,000 and is available comparably for $56,000 via Make Offer. That is a fair value as that price is on par with the PCGS Price Guide even though in reality there is no price guide that can rightfully depict the prestige that the 1895 Morgan beholds. Why we love it: The Thanksgiving Week CWL would not be complete without a beautiful gem example of the popular and desirable Pilgrim Commemorative. This Issue comes from a lower mintage of just 152,112 coins struck and it commemorates the Pilgrims landing at Plymouth, Massachusetts, in 1620. The eye appeal of this piece is lovely as it displays pristine lustrous surfaces covered in light golden toning. Value: The PCGS Price Guide has this coin valued at $400 with the CPG Value set comparably at $390. 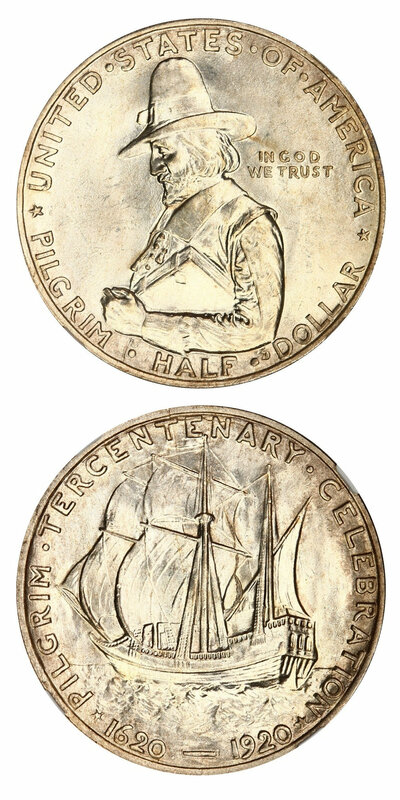 This timely offering of the Pilgrim Commemorative comes with a best price of $325 with discounts off both price guides even considering the beautiful luster and toning of this gem example. Why we love it: The $50 Humbert, commonly referred to as the “Gold Slug,” is such a scarce and unique issue desired highly across numismatics. These were a reliable currency used in the period of the California Gold Rush, before the United States could produce enough coinage for everyday use. This piece is an impressive survivor as it possesses surprisingly flashy, lustrous fields with pretty, deep golden copper toned devices. Value: The PCGS Price Guide has this coin valued at $42,000 although our example can be purchased via the Make Offer function for a sizable $6,000 discount for just $36,000. That is an excellent value for this famously popular Gold Slug as its rarity and desirability are unmatched among California Territorial Gold!